"Vickie Milazzo and the phenomenal success she has achieved for herself and others is astonishing. 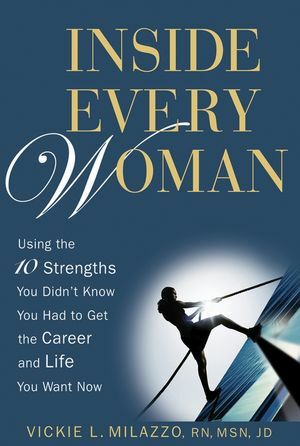 It doesn't matter what your life or career goals are, the 10 strengths she reveals Inside Every Woman will make it happen for you." "Vickie is an amazing woman who turned her ideas and dreams into a suc-cessful business." "If your life is less than perfect and your happiness falls short of complete, buck up and buy this book. It's stuffed with good advice, real-life stories and womanly wisdom." From a shotgun house in New Orleans to owner of a $16 million business, Vickie Milazzo shares the innovative success strategies that earned her a place on the Inc. list of Top 10 Entrepreneurs. She is the owner of Vickie Milazzo Institute, an education company she founded in 1982. Her company was just named to Inc.'s inaugural list of the Top 5000 Fastest-Growing Companies in America. Featured in the New York Times as the pioneer of a new profession for nurses, she built a national professional association of approximately 6,000 members and is recognized as a trusted mentor and dynamic role model by tens of thousands of women. Make These Promises to Unleash the 10 Forces Within You. 5 Promises Provide the Fuel. Promise 1: I Will Live and Work a Passionate Life. Promise 2: I Will Go for It or Reject It Outright. Promise 3: I Will Take One Action Step a Day Toward My Passionate Vision. Promise 4: I Commit to Being a Success Student for Life. Promise 5: I Believe as a Woman I Really Can Do Anything. Harness Your 10 Feminine Forces with the 5 Promises. Ignite Your Inner Fire to Live Passionately. Passion Fans the Flame of Success. Let Your Passions Move You. Discover Your Fire to Live Passionately. Th e Passionate Path Isn’t Quick and Easy. Passion Doesn’t Burn the Same for All Women. Nine Strategies for Living Passionately. Ignite Your Fire with the 5 Promises. Imagine Unlimited Possibilities to Capture Your Vision. Order Off the Right Menu. Show Up with No Guarantee. Trust Your Way Through the Chaos. Accelerate Achievement with Hypnagogic Imagery. Hitch Your Vision to Your Passion. Be Ready with Your Next Vision. Capture Your Intuitive Vision with the 5 Promises. Engage Commitment to Achieve Big Things. Engage Your Fears to Conquer Th em. Engage One Big Th ing at a Time. Engage in What’s Right, Not What’s Easy. Don’t Be a Commitment Queen. Engage to Achieve Big Things with the 5 Promises. Flex Your Agility to Grab New Opportunities. Agility Is a Two- Minute Investment. Don’t Be a Relic of Past Splendor. Leave Your Old Comforts at Home. Flex Your Agility with the 5 Promises. Intensify Your Intelligence for Accelerated Success. Genius Is Trusting Your Own Voice. Genius Combines IQ and Hard Work. Employ the Genius of Einstein. Intensify Your Genius with the 5 Promises. Practice Uncompromising Integrity for Authentic Success. Consensus on Integrity Is Elusive. Put Your Integrity Where Your Mouth Is. Refuse to Be an Integrity Victim. Avoid the Lure of Manipulation. Practice Uncompromising Integrity with the 5 Promises. Fuel Your Endurance to Energize Your Performance. Keep Dancing Your Passionate Vision. Fuel Your Endurance with Persistence. Fuel Endurance with Incremental Payoffs. Fuel Endurance with the Right Focus. Endure for the Fun of It. Take to the Air Like a Butterfly. Fuel Your Endurance with Fire. Harvest Energy to Increase Your Endurance. 10 Strategies for Building Your Endurance Muscles. Fuel Your Endurance with the 5 Promises. Become the CEO of Your Career and Life. Be First at the River to Get a Drink. Satisfy Your Thirst at the River of Choice. Venture Out from a Solid Foundation. Become the CEO of Your Career and Life with the 5 Promises. Reclaim Your Life Energy Th rough Frequent Renewal. Renew Your Relationship with Yourself. Renew Your Physical Energy Daily. Nurture and Renew Your Spirit. Renew Your Energy with the People You Love. Six Additional Strategies for Total Renewal. Reclaim Your Life Energy with the 5 Promises. Fuse with Incredible Women to Attain the Impossible. The Story of the First Female Fusion. Th ree Stories of Women Forever Changed. Female Fusion Is a Protective Caprock. Fusion Is More Th an a Women’s Group. The Basic Fusion Format Is Simple. Spark Fusion Throughout the Entire Group. Have Fun with Fusion as You Attain the Impossible. Activate Female Fusion with the 5 Promises. Inside Every Woman Is a Lifelong Adventure.